Caleb Kravitz ‘20 is the classic Shorecrest State Champion. He worked for years to develop his talent and skill to be the best in the state in his specific event. Winning a State Championship in swimming in Florida is a big deal. Florida is where universities come to find swimmers, divers, golfers and tennis players. Families and coaches from around the world send their best athletes here to attend high school and college. Our weather allows student-athletes to train year-round. 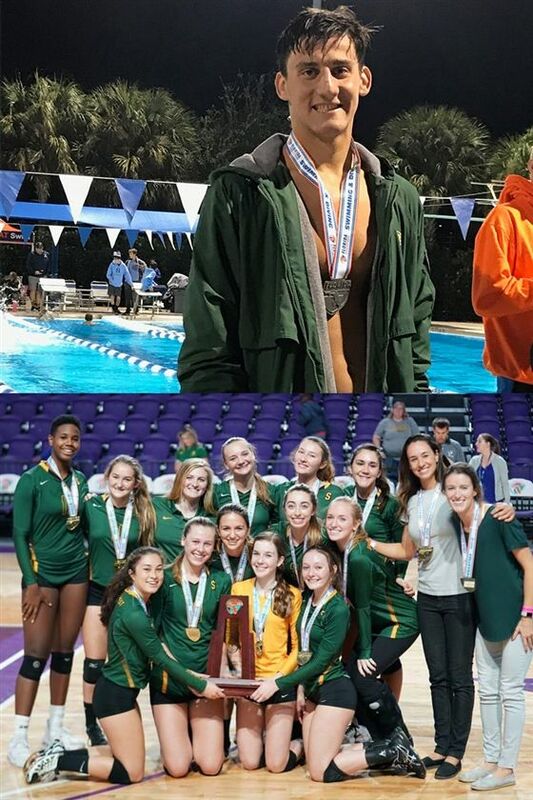 Even with all the wonderful swimmers and swim teams we have had at Shorecrest over the years, Caleb is the first State Champion Charger in swimming! He broke the school record in the 500 Free, which is a challenging event. Caleb’s achievement will hopefully inspire many younger students to make the sacrifices necessary to be a champion. Caleb’s State Championship is special, indeed. Winning a Team State Championship at Shorecrest is equally special. We tend to be a school of individuals with a heavy focus on academics and the desire to be involved in many activities. Our State Champion Volleyball team has that blend of student-athletes who excel in academics, athletics, arts and service. Yet many of them dedicated themselves to developing an expertise in volleyball, and the synergy of the individuals resulted in a special season and a very thrilling result! The stars aligned for the twelve girls on the team and their coaches, but not without a few solar flare ups that all great teams learn to overcome. Our Charger volleyball players peaked at the right time. Cheers to the coaches and to every member of the team for a wonderful achievement. Without speaking to each person individually, I am confident in noting that our state champions are appreciative of the coaches, family members, and fans who have supported them over the years. One does not become a champion overnight. In all likelihood, someone drove our champions to hundreds of practices, meets and games. Someone was there to encourage them through, injuries, losses and other disappointments. Someone was there to give praise for faster times and great play. Someone was there to push our student-athletes past the point of pain. These are the stories of most champions and undoubtedly the case for our Charger champions. What about the student athletes who qualified for the State Championships in diving, swimming and golf but did not win their events? We can be assured that most student athletes would have loved to earn the opportunity to compete at the state level. The achievements of all state qualifiers may not be memorialized on record boards, but we celebrate their hard work, skill, and achievement and trust they all have bright futures ahead.